To Be or Not To Be is a choose-your-own-path version of Hamlet by New York Times best-selling author Ryan North. Play as Hamlet, Ophelia, or King Hamletif you want to die on the first page and play as a ghost. 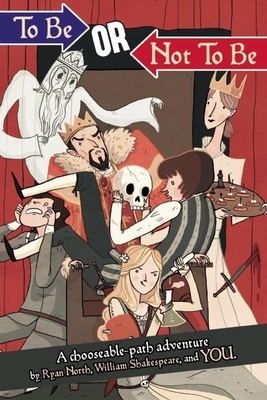 It's pretty awesome Readers can follow Yorick skull markers to stick closely to Shakespeare's plot, or go off-script and explore alternative possibilities filled with puzzles and humor. To Be or Not to Be became a sensation when it launched: over 15,000 people backed the book in just one month, and it remains the number-one most funded publishing project ever on Kickstarter.com. Ryan North is the writer behind the super-funny webcomic Dinosaur Comics, the critically acclaimed and Eisner-nominated Adventure Timecomic, and the coeditor of insanely popular self-published Machine of Death, which became Amazon.com's number-one best-selling book on the day it launched.A sequel, This Is How You Die, will be released in July 2013 from Grand Central Publishing. North lives in Toronto."